A supplement of crucial importance for, but not limited to, cardiac health! In addition to protecting the cardiovascular system by neutralising homocysteine, Swanson Folic Acid is also an extremely important part of the proper diet of all pregnant women. 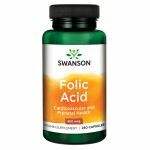 The U.S. Public Health Service announced that a daily folic acid intake of 400 mcg mitigates the risk of having a child with congenital brain and spinal cord defects. Our handy capsules guarantee you a healthy daily intake of folic acid.